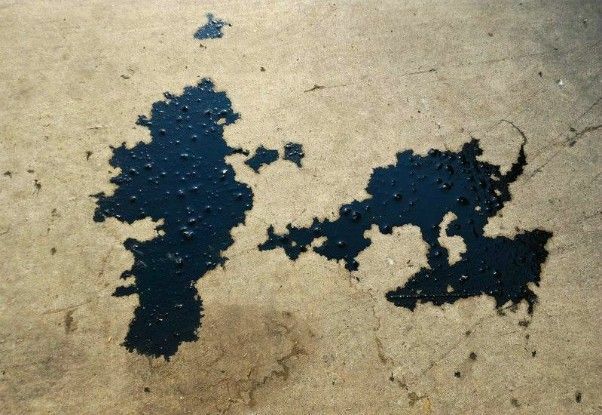 How to remove oil stains and grease from your garage floor can depend upon the size and age of the stain, as well as the surface texture of the concrete. Many times, the best way to remove these stains will vary from floor to floor. Regardless, they are an eyesore to anyone that likes to maintain a clean garage floor or driveway free from oil stains. The problem is that concrete is a very porous medium that can absorb oil and other liquids like a sponge. If allowed to sit for a while, oil will soak into the garage floor and do a great job of infuriating the efforts of even the most determined to remove it. Using a powdered detergent to scrub or make a poultice. Applying concrete degreasers to emulsify and lift the oil stain. Engaging oil eating enzyme cleaners known as bioremediation. If you have an oil stain that is fresh or fairly recent, one of the best cleaning agents to use is a powdered laundry detergent. 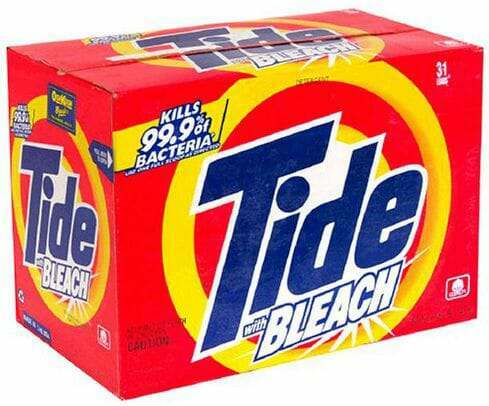 In fact, Tide used to be NASCAR’s standard oil cleaning agent years ago until the more sophisticated oil-dry products were developed. Additionally, we recommend using laundry detergent for your general purpose garage floor cleaning. Any powdered laundry detergent will work. Start by blotting up any heavy residue that may be on the surface and then pre-wet the stain as well as the surrounding area. Oil that is freed from the cleaning process can migrate and cause a secondary stain on the dry concrete if you don’t do this. Next, mix a strong solution of 1 cup powdered detergent to 1/2 gallon of hot water in a bucket. Pour it onto the oil stain and then sprinkle more detergent directly onto the stain itself. Use a stiff bristled nylon brush or deck brush and start scrubbing away. Be sure to let the soapy solution sit for a few minutes but do not let it dry. Letting the mix sit allows it to penetrate into the pores of the concrete and emulsify the oil, effectively lifting it out of the concrete. Use a high pressure nozzle to rinse away the solution. The water pressure helps to lift the remaining emulsified oil out of the pores and remove the stain. Using a wet/dry shop vac on the sudsy solution while rinsing works well also. If some of the stain remains, the next step is to make a poultice with the laundry detergent. Pour a cup or two of detergent into a container and add just enough water to make a paste. Spread a thick layer of the paste onto the still damp oil stain and cover it with plastic to slow the evaporation process. This homemade poultice will help to draw the remaining oil out of the concrete. Let it sit at least overnight and then uncover it to dry. Once it has dried, scrape it up with a putty knife and rinse off any residue. For more stubborn oil stains or stains that have sat for quite a while, we recommend using a strong concrete degreaser. Degreasers work well at penetrating the stain, breaking down the oil, and drawing it up and out of the concrete. Of the many that are available, Oil Eater is one of our favorites. It is an Eco-friendly industrial oil stain remover that works very well. You can find it here from Amazon. Start by pre-wetting the stained concrete with hot water. Next, mix a very strong solution of the degreaser and then pour it directly onto the stain. Let is sit for a few minutes and then scrub the area well. Let it sit for another 5-10 minutes. This allows the solution to work its way into the pores of the concrete and break down the oil. Do not let it dry. If it starts to dry before the time is up, add a little more solution and scrub again. Rinse the stain clean once the time is up. 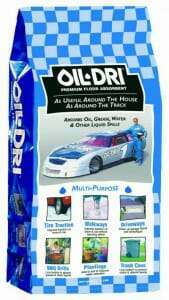 Oil-Dri is another product that is handy to use. It is a natural poultice that works well for cleaning freshly spilled oil. You can find it here from Amazon. However, it also works well in conjunction with using a degreaser. Once you have scrubbed the oil stain and let it sit, add a little more degreaser to the area and then cover it liberally with the Oil-Dri. Work the Oil-Dri over the stain with a broom. Make sure that you have enough on the garage floor to absorb it all without turning completely wet. Let it sit overnight and then sweep it up. The oil stain on the garage floor should be gone. For oil stains on a garage floor that have been embedded for a long time, you may need to take a different approach. As long as you are not under a time constraint, one of the best oil stain removers is the process of bioremediation. It is an all-natural Eco-friendly solution that is easy to use and works extremely well. Bioremediation involves the use of micro-organisms that go to work by breaking down and eating the hydrocarbons of the oil. It is also the best way to help restore your garage floor or driveway to it’s original appearance for a more natural look. The first of these that we can recommend is Terminator-HSD. It’s a dry powder that requires a mist of water to activate the live bacteria. An application generally requires up to a week to do its job. It takes a few applications to work on the toughest of stains, but it does work. And the best part is no scrubbing is required. You can find Terminator-HSD along with before and after images of oil stained concrete here from Amazon. Eximo is another example of such a product. It’s a waterless solution that uses a dry powder that you apply and sweep over the stain. We’ve used this one ourselves for a few different projects and I’m still amazed at how well it removed the oil from the garage floor. You can find it here from Amazon. Eximo is one of the longer working solutions and can require up to two weeks per application to work. Two applications are usually all that is required to completely remove the oil stains from your garage floor. This last method involves the use of a solvent and a very strong poultice. This is only recommended if you have tried one of the first two methods without success and don’t have time for a bioremediation treatment. You will need to use a solvent such as acetone or MEK. These solvents are known for breaking down and extracting oils. They also do a good job of penetrating smooth concrete. Start by pouring a liberal amount of the solvent onto the oil stain. Let is sit for a minute and apply again if necessary. Once it has soaked into the concrete, cover the stain with a coating of pure Portland cement. Do not use premixed concrete or mortar mix. 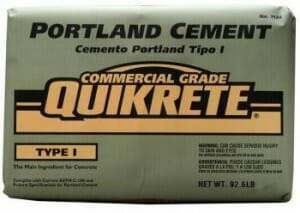 Portland cement is a fine hygroscopic powder that will absorb the oil. It works better than most poultice products for this procedure. It’s best to let it sit for a few days and up to a week to work properly. You can cover it with a garage floor mat or cardboard if you like while it sits. When ready, just sweep it up and the stain will be gone. Warning – Fumes from solvents can be very flammable so make sure you turn off any pilot lights or open flames before you apply the solvent. You can relight after the solvent is covered. Just remember, any oil stains that have been on your garage floor for a period of time may still leave the concrete darker in color or leave a faint shadow or outline of where the stain once was. This is due to the remaining hydrocarbons from the oil that has attached itself to the concrete. Though the concrete may be darker in color, a properly cleaned oil stain will remove have removed the oil residue and will not impede the proper concrete prep for a sealer or coating. Note: One method of removing oil stains that you will find on the internet is the use of muriatic acid. Do not do this! Muriatic acid is used to profile concrete by breaking down the surface for application of coatings and sealers. If used to remove oil stains you will still have oil within and a weakened concrete surface that will look different than the rest of the garage floor. Bioremediation products are one of the few methods that work towards restoring your concrete back to its original state. These are ideal to use if that is your intention. Lastly, if you are quick at cleaning fresh oil spills, you shouldn’t have to worry about evidence of an oil stain being on your garage floor at all. Once all the stains are removed, now would be a good time to take some preventative measures to seal your floor to protect it from anymore spills or drips. If you have a vehicle that leaks oil, you can elect to put down a garage oil mat as well to make your concrete that much easier to keep clean. My two cents? As someone who works with cars in his free time I honestly decided it’s easier to just purchase professional oil cleaning materials. Why put twice as much work into scrubbing my floor as I put into my actual hobby? Investing in real absorbent products has been worth every penny. Stuff like SpillFix works really darn well – cleans up the spill AND practically eliminates the oily leftovers that leave slippery stains. Highly recommended for anyone who deals with oily or liquid spills on a regular basis! Hello Benny. We have to agree that when it comes to cleaning up an oil mess, absorbents work wonderfully. Being proactive with a probable oil stain is so much easier. The problem however is that not all absorbents like these work well at cleaning up oily messes that may have been in the concrete for a long period of time. We are however currently testing a new product that is a great absorbent and degreaser at the same time. So far we are highly impressed and hope to be releasing an article on this product soon. I recently found a product that removes oil stains at Auto Zone. Oil Vanish Oil Stain Remover. It is simple to use and works fast. can I add additional kerosene to the portland cement. after one day it does not appear to doing any good. Hi Lester. That is why it is recommended to leave the portland cement on for days. It takes time for it to work. The idea is to soak the spot with the kerosene first so that it has a chance to seep into the concrete. Once it’s been on for a while and while it’s still wet, apply the portland cement and then cover it up. Make sure you apply enough that it doesn’t all turn wet. If you feel you didn’t apply enough kerosene initially, sweep up the cement first and then repeat the process. I’ve tried many types of cleaners but had the easiest fix with kitty litter BUT, with a little different application. I soak up what will come up over night, the next morning clean it up and then take a little more, drop it on the spot and with my work boots I stand on it and grind it into the spot. The littler powders and presses into the oil. I wait for a bit and clean up with a little water. It’s cheap and easy- don’t knock it till you’ve given it a go!. I work as a Surface Prep Specialist for a major equipment distributor. I’m looking at a job for a customer and have encountered a lot of oil on hard trowel concrete. What are your thoughts on enzyme treatment to remove oil that has penetrated deep? Enzyme treatment can work well Greg if you have the time for it as it takes a while to do its work. Generally oil on a hard troweled surface does not penetrate very deep unless it has sat for years. If you are grinding the surface, many times cleaning the oil with a strong degreaser first and then grinding will eliminate most of the oil. I spilled a large amount of Minwax stain on my concrete garage floor. I after grinding the surface the stain is still very visible. Will an epoxy coating stick to this. Is Minwax petroleum based? Hello Greg. Minwax makes both oil based and water based stains. Drip some water over the stained area to see if it absorbs fairly quickly without beading up. If it does, then you will be fine with the epoxy. Baby powder or baking powder works well at absorbing newer oil spills. It also works good on clothing too. I have tried many methods for cleaning oil stains, tire marks, paints, etc. So, far the best I’ve found is the put some good old gasoline over the stain and wipe it up with a rag. Yes, that can sometimes work well Brent if the stain is not to old and deep. Gasoline and kitty litter is how I learned as a young boy in my father’s garage. You just need to be careful about the fumes near open flames. I have a concrete driveway more than 30 years old and had a oil stains from my car leaking it. Saw a review somewhere to use brake cleaner in a spray can along with some cat litter after it. I tried this and it works great. Hi Michael. Yes, it’s the same principle we list of soaking the stain with some solvent and then coating it with a poultice to draw out the oil.